How was your experience at Caltech? The opportunity to study with professors like Richard Feynman and Kip Thorne at Caltech and learn the physics we did was phenomenal. Of course, Caltech obviously wasn't the easiest place to study, and there were times when I had my doubts about whether I could do it. But to be surrounded by so many talented people and to know we were studying at the highest levels of the subject was incredible. To this day, my best friends are still those I made at Caltech. Did you have a career plan while you were in school? When I came to Caltech, my intention was to study physics. Richard Feynman was still there and I was also very inspired by my uncle, a high-energy experimentalist at Los Alamos National Laboratory. I declared my interest in physics pretty much the day I got to Caltech and I thought I was going to be a professor or research physicist. I really had no idea about Wall Street when I was at Caltech. You've had quite a varied career. How did you go from studying physics to working in the financial industry? In physics, I was part of the Alcator C-Mod project, which was a big U.S. Department Of Energy-funded fusion reactor. I was building a diagnostic experiment to measure the plasma density, and waiting around for the main reactor to start. Eventually, it started up, but one day, about six months into it, the part that carried electrical current to the magnetic field coils of the reactor just melted due to the excessive heat load. They were going to have to redesign and rebuild it, and as a result my Ph.D was delayed for a year. While I was helping to rebuild the machine, I continued to take business classes. One day, a professor suggested that I should get an MBA in finance, which I could do under MIT's one-tuition policy. I had actually finished all the second-year requirements for an MBA already, so that made total sense. I applied and was accepted. As expected, my adviser in physics wasn't happy about that, but he also wasn't going to stop me. By then, I was convinced I could contribute more to developing derivative markets in finance than fusion energy. In 1994, I finished my business degree, and in 1995, I graduated with my PhD in physics. 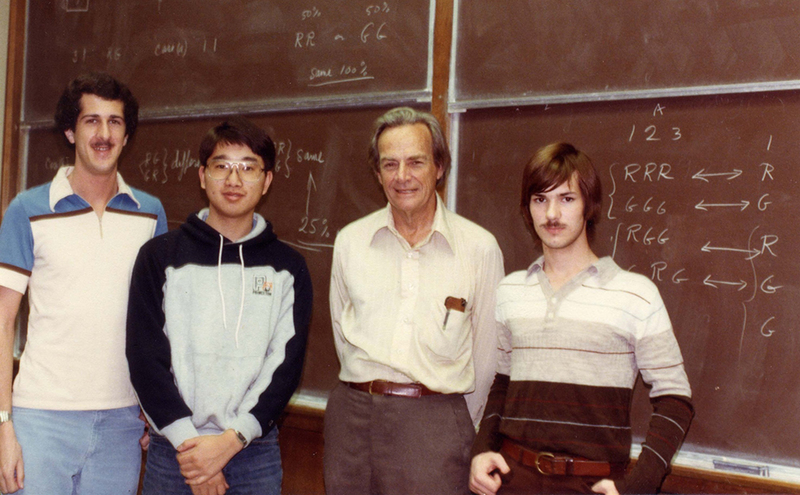 Thomas Luke (second from left) during his undergraduate years, pictured here with Richard Feynman (second from right). How did you end up on Wall Street? The transition to Wall Street was pretty straightforward. At the time, Wall Street was at the tail end of a hiring spree for technical people to work on derivatives and options—another type of financial contract—and I got offers from almost every bank on the Street. I decided to go to Credit Suisse Financial Products, which at that time was a very small subsidiary of Credit Suisse First Boston (CSFB) with about 200 people globally. Most of the CSFB employees were mathematicians and/or physicists with PhDs. I had all my finance theory behind me, but I had never worked in the field before. They seemed to think that I was good with people so they made me a structurer, designing financial products for clients. They just threw me in and I started working and learning as I went. That was how the Street was back then. It was an eye-opening experience. After two years, I decided I wanted to be a trader. J.P.Morgan had an opening for an exotic derivatives trader, so I moved over there. I must say it was a lot of fun. Exotic derivatives were the most complicated type of options at the time. We had a lot of freedom to innovate and we came up with a lot of creative products. I also learned the discipline of trading and risk management, which would serve me well later on. In the following years, I also worked at Goldman Sachs, Deutsche Bank, and Merrill Lynch, where I ran several different lines of business. The financial crisis of 2008 hit while I was at Merrill Lynch, which ended up merging with Bank of America. I soon realized structured products and exotic derivatives were never going to come back the way they had been before the crisis, so I moved over to Alphadyne Asset Managemnt to be the chief risk officer in 2012 and work with my old boss and many colleagues from J.P.Morgan and Goldman Sachs. The risk role was quite well suited to the skill set I had developed over the years through risk managing a global team with many different products types, and the past few years at Alphadyne have been a very exciting and educational evolution in my career. Philosophically, what we mean by risk management is not what most people think. It's not necessarily all about preventing people from losing money. It is actually about providing the utmost transparency to managers about what can happen to their portfolios. It's about giving people the necessary information so they know the potential downside risks they take when making investments and allowing them to make informed decisions about risk and return. Was there anything about your experience at Caltech that was valuable as you navigated through your career? At Caltech, we pushed ourselves so hard, there isn't anything I face today that challenges me to the point I say, "I can't do it." What I got out of Caltech was the confidence that I could do pretty much anything. Do you have any advice for students who are interested in pursuing a career in a field outside of their field of study? Never underestimate the importance of fundamentals, even in topics that you think are out of your current scope. The No. 1 thing you learn at Caltech is how to think. It's not about the specific knowledge you have about biology, chemistry, or whatever. If you learn to look at a problem and break it down, you can apply that process to anything. I'd also like them to remember that they should not be doing anything they don't enjoy. You're not just doing a job. You should be doing something that fundamentally inspires you. Whatever your field of study, I think it's important to not get too hung up on where you are in your career today. In five years, you will not be in the same place and probably not doing the same thing. As long as you are learning and being challenged, you will be OK. The world is going to change and you will need to change with it. Whether you go into finance or academia, you're not going to work on the same problem for the rest of your life. The ability to stay nimble and open-minded is a key skill. The interdisciplinary nature of the world is exploding. The problems are interdisciplinary, so the solutions have to be as well.